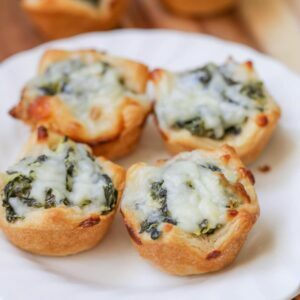 This favorite appetizer is filled with spinach, artichokes, and three different cheeses, all baked into a crescent dough cup. Spinach Dip Bites are a hit every time they're served at a party or get together! Using a rolling pin, lay out dough on a cutting board and lightly stretch to a 8 x 12 rectangle. Cut dough into 2 inch squares, so you have 24 squares total. Bake at 375 for 15 - 17 minutes, until golden brown. Let cool for 5-10 minutes before moving from tray. ENJOY!